The Honeywell DT8050 is a hardwired DUAL-TEC motion detector protects an area of 53' x 72' and provides immunity to pets up to 100 lbs. The DT8050 is a high performance small form factor motion detector that offers a trouble-free, out of the box emperience to simply the installation process and reduce time. With the passive infrared DT8050 optimum performance is achieved using custom developed extended range Fresnel optics, look down, cover and wall tamper, and selectable pet immunity. 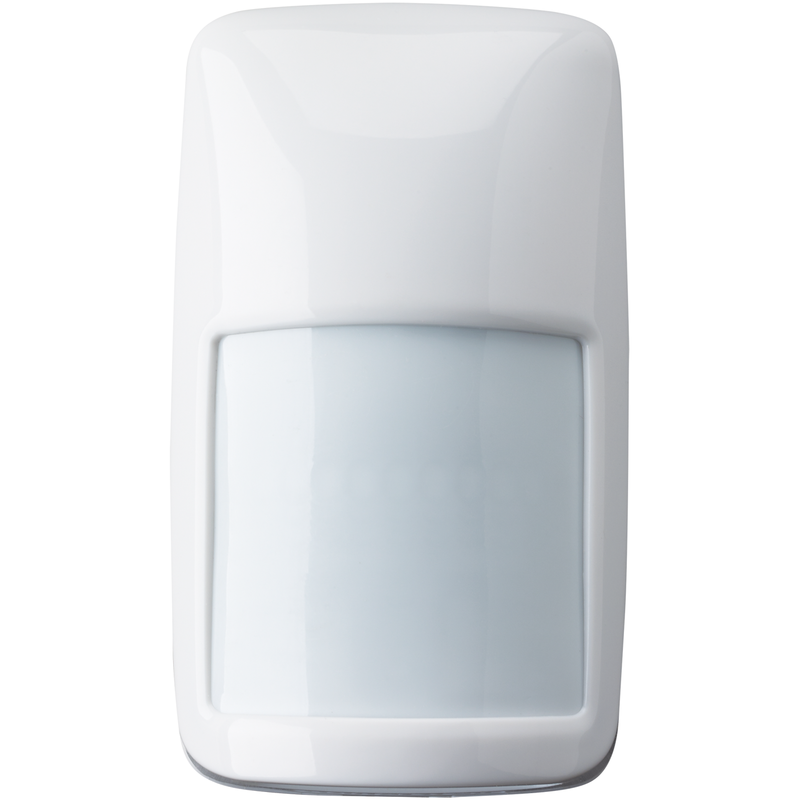 Leading edge sensing technologies and a wide range of models to suit the requirements of most applications, the Honeywell DT8050 motion detector will maximize intruder detection while diminishing false alarms. Sleek, Sturdy Housing: The sleek, sturdy housing blends with any residential or commercial interior and is constructed of ABS plastic for superior shock and impact protection. It contains a convenient wiring channel, knockouts for mounting and wiring, and easy access to terminals. Mounting screws are located in the rear cover, thus enabling an easier installation. Sealed Optics and Electronics: The optics and electronics are assembled into the front enclosure and sealed with a protective cover to prevent damage during installation. The sealed optic chamber also prevents drafts and insects from affecting the detector. Integrated Screw Retention Features: To mount the detector on the wall, the DIYer will insert the screw in the integrated mounting feature where it will be automatically held in place, making the mounting of the detetor easy and quick. Uniform Sensitivity Optics: The custom designed Fresnel lens provides the same sensitivity for human targets at the edge of the pattern as exists directly in front of the detector, giving these detectors consistent coverage throughout the protected area. Shorter precision focal lengths mean superior optics and detection. Wall-to-Wall Coverage: Wide and long detection coverage with look-down zone for coverage range protection that exceeds similar products in the market. Advanced DualCore Signal Processing (DUAL TEC): DualCore signal processing analyzes PIR and microwave signals through the microcontroller. It supports a multitude of advanced fuctions, including concurrent diagnostics, digital flourescent light interference filter, digital adaptive microwave threshold, adaptive baselines and bidirectional temperature compensation. Superior Detection and False Alarm Immunity: The DT8050 motion detector provides superior protection against false alarms without sacrificing catch performance. Pet-friendly Selectivity: DIYer's can turn pet immunity on or off with the flip of a DIP switch. When pet immunity is enabled, the detector can distinguish between signals caused by humans and signals caused by pets up to 100lbs. Selective Look Down: Provides better coverage up close with multiple zones in the look-down area. Look down is switch selectable. PIR White Light Immunity: A patented black bug guard reduces false alarms by providing 6,500 lux of white light immunity. This helps reduce false alarm problems cause by lights, flashlights or reflective objects. Flashlight Walk Test: Reduces installation time as the walk test can be enabled by simply waving a flashlight at the detector. Automatically times out. Flexible Mountings: The DT8050 motion detector mounts on walls or in corners, with heights from 6'9" - 8'9" (2.1m -2.7m). The DT8050 works with the SMB10 family of swivel brackets.